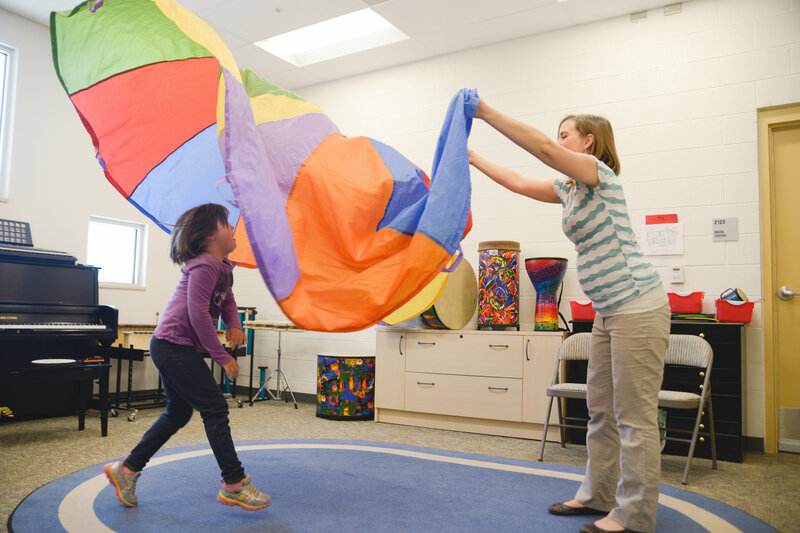 Music therapy can help special needs children learn to identify, express, and control their emotions. I was recently presenting at a conference and had a parent ask whether I can use music to help with emotional regulation for special needs children. I figured I could share my response here as well for any other parents who are wondering the same thing for their child who may have difficulty regulating their emotions. Music therapy is not a magical cure, but it can play a significant role in facilitating emotional expression, increasing validation, and learning proper responses to emotional stress and overstimulation. I love the power of music to facilitate emotional expression. Using large drums, banging boomwhackers together or on the ground, or playing large rapid note clusters on the piano can be incredibly satisfying when someone is angry or frustrated. With the help of a music therapist to support the experience (and to ensure safety! ), music can effectively be used to express emotions where words are inadequate or inaccessible for special needs children. I have had beautiful sessions with individuals who quite literally put their emotions right into an instrument when verbal communication was not an option or was too difficult. Music speaks much louder than words when it is used in this way, and can directly access the emotion centers in the brain (such as the limbic system) and thereby reflect back to the individual the emotion they are expressing. I have often seen the power of instrumental improvisation help individuals find voice for their anger and frustration in such a way that they leave the session in a completely different state. This has even worked in group settings with individuals with Autism. With one group in particular we frequently engaged in instrument improvisation as a group, and there would be a tangible shift of energy in the room as the session progressed. It felt loud and chaotic at first, then ended with a feeling of relief and rest. All through instrument improvisation as guided by an attentive music therapist! One of the essential techniques that music therapists are taught from the very beginning is that of the iso principle. I’ve written a post on this technique before, but for a brief summary, the iso principle basically means to meet a child where they are at as opposed to asking them to immediately change their behavior to match some outside force. This makes a lot of sense as you look into what is going on in the body and mind when someone is escalating, and this is especially helpful in working with special needs children. For example, when a child becomes angry or frustrated, their heart rate speeds up, their breathing quickens, and their mind and everything in their body moves at a faster pace. If I were to come in and try forcing Enya or some “relaxing” classical music on someone who is in this state, it literally would not match what the client is currently experiencing physiologically. If you think of music in terms of rhythm, melody, and dynamics as being synonymous with heart rate, breathing, and the overall physiological state it makes sense why slow music may be ineffective for someone in an escalated state. The most effective thing that a music therapist can do is present music that is similar to the individual’s physiological and emotional state, then gradually change elements of the music to help the person become more calm and centered. When I think of the iso principle the biggest thing that comes to mind is the idea of validation. Not only is this technique physiologically beneficial, but it also tells the individual that you hear them. You empathize with their current state enough to join them instead of immediately trying change them because that feeling is not “okay”. The iso principle is essentially saying “I see that you are angry! Tell me about it. Let me join you.” The simple idea of being validated can, for some individuals, make all the difference and help special needs children to become more calm. This technique does need to be used carefully, however. I have had a handful of clients who responded negatively to the iso principle and I found that they needed something separate from their current state in order to de-escalate instead of escalating further. To assume it works for everyone all the time would be a gross over-generalization, and application of the principle should be based on experience and careful in-the-moment assessment. I once set a social story to music to help a group of special needs children learn the proper response to stress (in their case the proper response was to ask for a break). I wrote a social story in tandem with the Speech and Language Pathologist to help teach this concept. The idea was to validate and describe what the individuals do when they feel angry, followed by the natural consequence (often going to time out). We then presented the appropriate response to the anger state and gave several opportunities to practice asking for a break. While the song did not decrease the frequency of outbursts, it did tend to increase the frequency of the individuals asking for a break. If I were to continue treatment with these special needs children I would add the other listed elements of validation and expression as outlined above to assist in their de-escalation process. As I mentioned earlier, these techniques are not a magic cure, but their principles hold true across many situations and individuals and are worth further exploration with special needs children. Hopefully this gives you some good ideas of how to use music effectively to influence emotional regulation!